A physicist in the College of Arts and Sciences has been awarded a major grant to help develop quantum computing technology. Britton Plourde, associate professor of physics, is using a three-year, $900,000 grant from IBM to conduct research for the LogiQ Program. LogiQ is part of the Intelligence Advanced Research Projects Activity (IARPA), based in the Office of the Director of National Intelligence. Short for “Logical Qubits,” LogiQ studies advanced and alternative computing platforms, quantum information science and qubit systems. LogiQ seeks to build the world’s first logical qubit, capable of storing quantum information immune to environmental influence or error. The grant award supports Plourde’s work on the IBM Superconducting Logically Encoded Extensible Qubit (SLEEQ) project. The purpose of SLEEQ is to implement quantum error correction techniques for the operation of the logical qubit. “The role of my research group in the project is to develop new types of superconducting qubits that are less sensitive to noise,” Plourde adds. For the past two decades, scientists have been advancing quantum technology, in hopes of realizing new possibilities for information processing and communication. Quantum technology is of interest to the U.S. intelligence community because quantum machines can potentially solve certain problems that conventional computers cannot. Quantum systems have applications ranging from biology and chemistry to materials science and medicine. Unlike classical computing, in which the basic unit of information (i.e., the bit) has a definite value of 1 or 0, a qubit can exist in two states at once, meaning it can represent 1 or 0 or both simultaneously. This is known as superposition. Important to speedup is another property called entanglement, in which quantum objects are able to maintain instantaneous connections, even when separated by vast distances. “When we exploit these properties, quantum systems could have the ability to decode encrypted information, churn through large networks of databases, or simulate complex quantum systems,” Plourde says. For all the excitement surrounding quantum computing, a large-scale quantum machine is still a ways off. Numerous innovations over the past decade, however, have led to significant improvements in the performance of superconducting qubits. A Syracuse faculty member since 2005, Plourde has been awarded multiple grants from the National Science Foundation (NSF), Army Research Office, and IARPA. He also is the recipient of an NSF CAREER Award and an IBM Faculty Award. 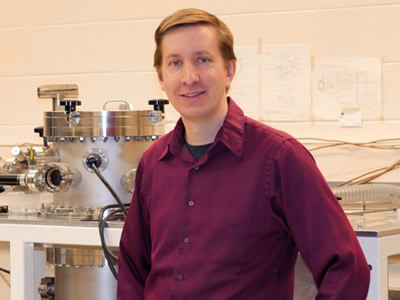 Plourde earned a Ph.D. in physics from the University of Illinois at Urbana-Champaign, and is editor-in-chief of Transactions on Applied Superconductivity, published by the Institute of Electrical and Electronics Engineers.